Even with the censorship -- not bad! But yeah beware, they tend to take ideas and manufacture their own version (limited International patent enforcement). But -- if it helps keep them from buying a bunch of Cadillacs to reduce their Carbon footprint, then I guess "by all means". 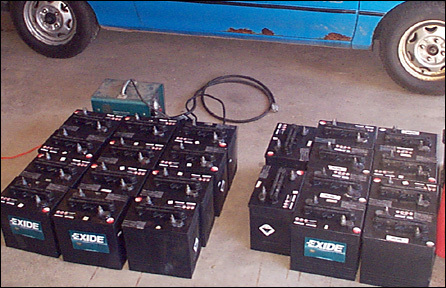 Or worse: cornering the market on used 6v batteries! So I forget whether I mentioned: we're going to take the car up to the EV Expo in Ottawa at the end of May. Dragging it behind Ivan's truck (need to make/rent a tow bar). There's no way we're going to be finished the electro/mechanical stuff by then, and we decided to switch the focus onto making it pretty. So this weekend I started doing some body work - cleaning up the worst of the rust spots. Got the driver's side done - just need to paint it (got a can of colour match paint mixed, and it seems to be a pretty decent match). EDIT: fortunately, most of the rust is below the trim strip, which makes touch-up less apparent (because you can paint small, complete sections without having to try to blend it in to a wider area of "good" paint). 've been chipping away (literally) at the body work since the last update. The driver's side repairs are painted as of yesterday, the hatchback is about half finished. Every panel/section on the car has some amount of rust that needs grinding, puttying, much sanding & finally painting. Discovered quite a large rust hole in the driver's side fender well/firewall area that leads right into the cabin (well, into cabin insulation against the firewall). Nevertheless should be no trouble getting it "finished" (and waxed up spiffy!) in time for the EV expo in 2 more weekends. Documenting the transformation in pics, which I'll post when it's all done. I'm not exactly doing a meticulous job (this is the ForkenSwift after all). It's a reasonable effort. So far it sure looks purty though! Sadly, paint supplies ($45) finally pushed the total built cost past the $1000 CDN mark. There will be some more batteries to recycle soon. I still haven't tried the "new to us" Ranger EV batteries in the car yet, but there's no doubt a number of the old forklift co. floodies will be recycled. Here's a thought for anyone else considering a conversion. If you're going to try hypermiling your EV, you might want to keep your clutch. We went for a direct motor-input shaft connection. It's less complex and saves weight (importantly: rotating mass). BUT - I've learned driving around the neighbourhood, even though the electric motor only has a fraction of the internal friction of the ICE when decelerating (only two bearings, and none of the ICE's engine braking), coasting the e-motor in gear slows the car perceptibly more than coasting in neutral. But the clutchless setup makes coasting in neutral more difficult. Getting to neutral is easy - just flick the gear lever out of gear when not under load. The problem is getting back into gear without coming to a complete stop. It requires rev-matching the motor to the speed of the input shaft. That's tough to do cleanly (or at all) when (a) you can't hear the motor, (b) have no tach, and (c) the transmission synchros are pretty worn out. It's open to debate whether the savings from being able to coast in neutral would outweigh the increased energy consumption of retaining the flywheel & clutch, but I'd bet an EV hypermiler would see best results from being able to use neutral easily/frequently. Should add: some "proper" conversions don't need to be shifted. The motor is torquey enough and the rev range high enough that often people leave it in 2nd or 3rd gear for around town, and only shift up if they're going on the highway. Shifting is better though if you want to try to keep the motor closer to its most efficient speed. Or if you don't have high enough voltage for top end power, like the ForkenSwift.